We’d love your help. Let us know what’s wrong with this preview of Hearts Ablaze by Kathleen Ball. In Kate's Outlaw, award-winning author E.E. Burke spins a suspenseful yarn about a half-breed desperado who abducts—and then rescues—a railroad heiress. On the run from danger, with enemies on both sides, Jake and Kate seek solace in each other’s arms…and ignite a love as powerful as it is forbidden. Ridin' For a Fall by Kirsten Lynn immerses you in a fiery tale of forever love. When circumstances force best friends and Wild West Show performers, Lena Boden and Kyle Allaway to marry and return to Wyoming, they must stand together against internal doubts and external forces seeking their destruction—or risk a fall that will knock them out of the saddle for good. A Warrior's Heart, by bestselling author Amanda McIntyre, brings to life the passionate story of a bold Cherokee warrior and the brave white woman he rescues from certain death. Thrown together by circumstances not of their own making, they overcome betrayal and tragedy to find a love strong enough to bring nations together. To ask other readers questions about Hearts Ablaze, please sign up. I’m a sucker for Western Romance. It was a time of such great hardship with men and women building their lives with little economic or political help. It took strength, discipline, and smarts to work hard and solve daily problems. The people of that era were tough, rugged people who lived through hardships yet still maintained emotional strength. Though I’m only one book in on this series, it promises to be an excellent sampling of western romance by many new-to-me authors. I started with E.E. B I’m a sucker for Western Romance. It was a time of such great hardship with men and women building their lives with little economic or political help. It took strength, discipline, and smarts to work hard and solve daily problems. The people of that era were tough, rugged people who lived through hardships yet still maintained emotional strength. Though I’m only one book in on this series, it promises to be an excellent sampling of western romance by many new-to-me authors. I started with E.E. Burke’s Kate’s Outlaw. Kate Parsons is a railroad heiress determined to run her father’s railroad. She’d invested her own money in the company and had worked hard to see its completion. But her father failed to see her as capable because she was a woman. As workers rush to complete construction through unfriendly Indian territory, the battle over land rights becomes an obstacle. Kate knows if she could find a peaceable way to negotiate with the Cherokee and ensure their success, she might change her father’s opinion of her. Jake Colson, accompanied by his cousin, sneaks into the railroad camp to steal the payroll. Because of past events, Jake doesn’t trust the white man and is prepared to do whatever it takes to stop them from taking his people’s land. When confronted by Kate in the middle of the robbery attempt, Jake’s cousin wants to kill her before she exposes them. Desperate to save her, Jake has no choice but to kidnap her. Now both Jake and Kate find themselves in even more of a predicament. Jake’s abduction of Kate could bring the Army after Jake and bring great danger to his people. For Kate, if her father had to ransom her, he’d never allow her to negotiate with the Cherokee. They would both fail at their missions if they didn’t help each other. And so their relationship begins as they travel across the countryside. Kate was supposed to be Jake’s prisoner, but the longer they rode together, the more they learned about each other, and a relationship formed. And for two people who came from different worlds, they appeared to be made for each other. Kate’s Outlaw is a real page turner about passion, trust, and hope. It has an original plot, well-developed characters, and a beautiful setting. I can’t wait to read the rest of the books in this collection. If you’re a fan of western romance, this will be a great addition to your library. A Book Obsessed Chicks Review Team Selection. Phenomenal work of art. Heart Ablaze box set is one of the best anthology sets I've ever read. This is the perfect collection for the historical romance lover. So proud of each and every one of these authors and the story they delivered. I highly highly recommend this book to everyone. A perfect satisfaction for your romance craving. Captivating and fun to read! 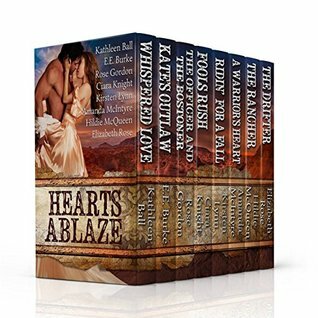 Hearts Ablaze Boxed Sets is a must to read, if you love romance with a western touch! Eight fabulous authors have reunited their talents to offer their readers, a delightful collection of short stories that will surely please you! My review is for these authors: E.E. Burke, Elizabeth Rose, Amanda McIntyre and Rose Gordon. Kate’s Outlaw, by E.E. Burke, is a wonderful romantic western romance!This author's books are always so interesting and fun to read! This story is p Captivating and fun to read! Kate’s Outlaw, by E.E. Burke, is a wonderful romantic western romance!This author's books are always so interesting and fun to read! This story is part of her Romance and Rails series. I enjoyed very much I loved her charming characters Jake and Kate. Chase Masters is a drifter, as the title shows! The Drifter, is nicely written by Elizabeth Rose, this charming romance, with a western touch, relates the sweet story of Chase, a drifter and a charming woman named Nessa. Her husband's was killed by a bandit, will she recognize him and confront him or find the true killer? Chase, is no killer, will help her forget, forgive and love again! In A Warrior’s Heart, Amanda McIntyre described the love story between a bold Cherokee warrior, White Eagle and a brave white woman named Sarah who is rescued from death. Together, they will embark on a perilous journey of twists and turns. Can their love for each other be able to survive under all this turmoil! Ms. McIntyre never disappoints me. The Officer and the Bostoner, by Rose Gordon, is a beautiful historical romance. It tells the story of Allison, a future bride going out west to meet her new husband, unfortunately, during her traveling, she held at a military post where she is forced to marry a charming officer. Both, Allison and Wes are so different! But perfect for each other! Utterly fantastic! Each book is very well written. Each author takes the reader on an exciting adventure with some amazing characters. All of these stories were really good. There were some that stuck with me more than others. My favorite was the Ciara Knight story. The entire book was very well-written and will have you on the edge of your seat from beginning to end. There wasn’t a “bad” story in this entire set. Sit back, grab a cup of joe, and enjoy the horseback ride of endless adventure. Wonderful box set, recommended reading. Best-Selling, Award Winning Author of Contemporary Western Romance and Sweet Historical Western Romance. Writing is my bliss and I try to write every day. I started with two publishers who I learned a lot from. Now I self publish. I like the control it gives me over release dates and book covers. https://www.facebook.com/ka Best-Selling, Award Winning Author of Contemporary Western Romance and Sweet Historical Western Romance.